Published Sept. 27, 2012 by Imperial Beach Patch. About 50 people attended Tuesday’s candidate forum that featured all five candidates vying for the two open seats. The candidates—Bobby Patton, Valerie Acevez and Erika Lowery and incumbents Brian Pat Bilbray and Jim King—discussed issues such as vacation rentals, luring businesses to Imperial Beach, medical marijuana and the future of the city. When asked if development should extend to other areas of the city beyond the waterfront, candidates unanimously said Seacoast Drive and Palm Avenue needed to be the focus. King, a current council member, said there are a number of outside sources the city should look to for funding projects like streets and parks in the eastern half of the city. Developing Seacoast Drive and Palm Avenue will provide the money to develop other parts of the city, said Bilbray, also an incumbent. When asked to share specific ideas on how to attract small businesses to the area, none of the candidates offered comprehensive or new ideas, but they did share opinions on how they view the city’s future growth. Pedestrian-scale lighting could attract more visitors and businesses, he said. Acevez said she wants to see more tourism on Seacoast Drive and IB needs to figure out how to stop on Palm Avenue. Lowery said she wants to see small businesses grow in IB, and development on the waterfront should not grow too large. Lowery said she grew up in Coronado and moved to IB to avoid Coronado development. “That’s why I live here and not up there,” she said. In contrast, Bilbray said he believes Pier South should have been taller in order to generate more tax revenue and bring more visitors to the community. Starting with the new four-story American Legion, density should be concentrated on Palm Avenue, King said. Amendments to the city’s commercial zoning will also attract commerce. “Business brings business,” he said. Both Acevez and Lowery said trouble with building permits is part of the reason they entered the race. Two questions were asked about the city’s building permit process and planning department. Lowery suggested time efficiency and common courtesy classes for city staff and starting a “one-stop shop” where permits for homeowners and businesses can be processed quicker. Our government works for us. We write the checks, she said. IB should look at other cities nearby and adopt practices that cut through red tape. Public-private partnerships can also streamline processes, he said. Councilmembers are not directly in charge of city staff, Bilbray said. The city’s building permit staff are up to the city manager. Because of all the regulation they must enforce, the building staff, which is in the Community Development Department, is often the most despised department of any city, King said. A culture needs to be developed among city staff that ensures people are dealt with the right way. “I think also training for the staff is very important in terms of how they deal with people because often times the manner in which a person is dealt with puts them off, and well-trained staff can make even the most difficult situation easier,” King said. 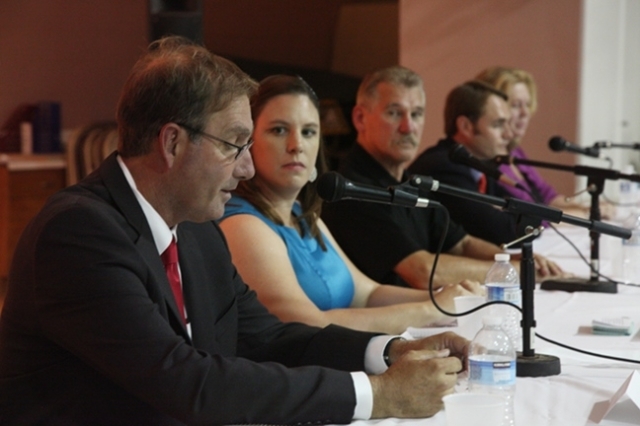 When it comes to medical marijuana in Imperial Beach, the candidates were unanimous in their opinion that sick people who want access for medical reasons should be able to do so, but they differed in their evaluation of Prop S.
Both Lowery and Bilbray received endorsements from the San Diego Republican Party whose official position is no on Proposition S. Lowery said she is in favor of the Safe Access Ordinance of Imperial Beach after seeing the impact the drug may have on people in their own families who are suffering from illness. Bilbray has not said whether he supports the Proposition or not but did sign the petition. King and Patton both said they are against Proposition S.
Patton established the city’s Imperial Beach Junior Lifeguard program and said he wants to establish a Youth Task Force that can assess young people’s needs. Programs that serve IB’s youth should be expanded, he said. Ed Sorrels was in the audience Tuesday and said it’s too soon to say who he will vote for on Nov. 6. He said he really likes Lowery, and he continues to be a fan of King, who he called “a voice of reason and calm.” But Acevez, he said, doesn’t have enough knowledge to run now. Michael Dennison, 50, disagreed. He said Lowery had too many canned responses and Acevez has his vote. Dennison is a member of Americans for Safe Access and one of three signatories on the original petition to put Proposition S on the ballot. Despite their differing opinions on the candidates, Sorrels and Dennison agreed on one thing: more people should have attended the forum. Sorrels said, “The biggest disappointment of this: that we didn’t have 500 people here in a city of 27,500,” he said. 1. How do you balance economic development with quality of life for the residents? 2. What do you think the priorities of City Councilmembers should be? 3. How do you feel about reviving other neighborhoods besides Seacoast Drive? 4. Getting permits and needing permits for everything is not community friendly. What can you do to help this problem? 5. How should citizens who need to use medical marijuana in Imperial Beach do so in the future? 6. How do you feel about height and density for future projects? 7. Have you been to any city council meetings? What were your thoughts and what would you change? 8. Each of you has said you want to encourage small businesses to locate here. Please give a specific way you would envision luring a business to locate in IB. 9. We pay EDCO an ever increasing amount to haul away the garbage cans we generate in our city. A lot of IB residents are making greater efforts to reduce our carbon footprint by recycling and reducing etc. Why are we paying the same amount as our usual mass garbage generating neighbors? 10. According to Ben Franklin, Those who trade liberty for freedom deserve neither. What is your definition of public safety and how would you balance our liberty vs. public safety? 11. What would you do to increase the professionalism of the building and building inspecting department? 12. What is your position on vacation rentals? 13. What would you do for our children in IB? 14. What should IB be like in 10 years? 15. Tell us about your background why does that make you a good city council candidate. How else are you involved in the city? Mayor Jim Janney, City Manager Gary Brown and several past candidates for office attended the forum sponsored by the Imperial Beach Chamber of Commerce and moderated by the League of Women Voters. Candidates will speak again Thursday morning at the chamber’s monthly breakfast. Congressman Brian Bilbray—who was mayor of Imperial Beach in the late 1970s and early 1980s and is the father of the current Councilman—was also in attendance. This entry was posted on Sunday, June 22nd, 2014 at 7:59 pm. It is filed under Story Archive and tagged with government, Imperial Beach City Council, Imperial Beach Patch, politics. You can follow any responses to this entry through the RSS 2.0 feed.